No matter what size or age your sweet puppy is, a comfortable and supportive dog bed for her is a very important purchase. Even if she sleeps with you in your bed sometimes, a bed of her own gives her a place to retreat to when she needs time to herself. It should be cozy, appropriately supportive for her adult size, safe, and off-limits to children. Durability is a big plus, especially for your pocketbook. Cheap beds do not stand up to daily wear. They also do not support growing and aging bones and joints. In this article, we look at five indestructible dog beds which should make you and your pooch rest well. 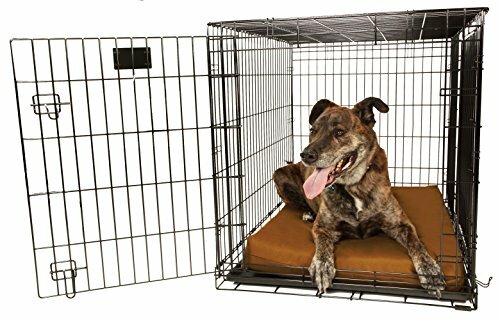 Orthopedic 4" Dog Crate Pad by Big Barker - 48" x 30". Waterproof & Tear Resistant. Thick, Heavy Duty, Tough, Washable Cover. Luxury Orthopedic Support Foam inside. Made in USA. Sized to perfectly fit inside a 48" x 30" crate. If you’ve lived through the puppy stage with your sweet one, you know those little teeth need things to chew besides kibble. Without supervision, they sometimes mistake their beds or your shoes for bones and other appropriate chewables. Even well-behaved adult canines like to have a good ol’ chew now and then. This information from VCA Pet Hospitals is a good resource for taming those chompers your girl might have. Dogs have been known to chew through any material, even wood, brick, metal, and Kevlar. Tenacious chewers can rip and shred apart some beds marketed as “indestructible” within minutes. What is “chew proof” for one pup might only be “chew resistant” for another. There are many reasons for destructive chewing. Boredom, separation anxiety, puppy teething can all be triggers. You should first determine your dog is not suffering any health condition causing the bad habit. If she is healthy but just giving in to the urge, work with her to change the behavior positively. For a dog bed to be indestructible it must be thoughtfully made with a dog’s nature in mind. Many of our furry friends are nesters. They like to dig a hole wherever they lie down, be it in the dirt or in their nice crib. This can break down the bed’s internal material quickly. Other canines like to search for weak spots in their object of chewing delight and this can include zippers. Most bed covers are held together with cheap zippers so the cover can be removed for cleaning. Other weak points include seams, corners, and fabric edges. Lastly, the cover material can get repeated abuse. Dragging across the floor, tug-o-war, ripping with the teeth…all these activities and more will quickly destroy a normal bed. If your dog is a powerful and determined chewer, you will need to choose her durable and tough dog bed with much thought and research. Keep reading for tips on what to look for in a truly indestructible dog bed. Don’t despair if you are searching for a comfortable and tough dog bed for your special pup. We have identified several key design details to help you make the best buying decision. The filling will determine the bed’s support and longevity, say the pet care experts at Drs. Foster and Smith. If your pooch is small and lightweight, a bed with a softer support system is a good choice. These dogs would find it hard to settle into dense memory foam. Look for beds for these pups that are poly filled and baffled in interlocking tubes. Large breeds and older dogs with joint discomfort really enjoy the support memory foam beds offer. This filling adapts to the dog’s body weight while offering maximum support. Look for filling with a minimum of 5” foam. Whichever filling you choose, make sure the interior chamber is sealed well and the seams are impossible for the dog to access. A waterproof cover over the filling is a great added touch. This component is the first line of defense against abusive behavior. Canvas and normal fabric will not withstand the tough conditions some fidos can dish out. Look for covers made from military-grade fabric and material made especially for tough chewers. These materials will also guard against urine and vomit accidents. Zippers are a point of weakness in a bed that tough doggies are waiting to exploit. Most beds have a zippered cover for easy removal to throw it in the washing machine for cleaning. The zipper is normally found around the outside edge of the bed, making it very accessible. We like beds that use industrial strength Velcro™ closures concealed on the bottom of the bed. Out of sight, out of mind. Even on square or rectangle beds, rounded corners without seams to grab lengthen the life of a bed. Without anything to grab on to, these normally weak areas aren’t as vulnerable to attack from powerful chewers. Add in well-sewn seams elsewhere on the bed and the durability factor goes way up. The design of the heavy duty dog bed you purchase will depend on the sleeping style and needs of your furry friend. Just as with people, every pup has her own favorite sleeping position. There’s a bed to match each. The Pretzel — She curls herself into a tiny ball with her nose tucked into her tummy. She would enjoy a nesting bed with high walls or an overstuffed pillow ball to sink into and feel secure. The Sprawl — She likes to spread out all the way on her bed. Extending her legs, head, and tail feels great! For this dog, a traditional mattress style bed is a good choice. To increase the comfort, try a bolster bed with a supportive, raised cushion around the edge. Make sure the bed is large enough to accommodate her full size. The Senior — This girl has earned her comfort. Due to painful joints from arthritis or just a life well lived, an orthopedic pet bed is the best choice. These beds are available with box spring and medical-grade foam construction. You want to choose the most supportive material possible while still allowing for comfort. Orthopedic beds come in bolster, nest, and traditional styles. We have reviewed five of the best tough dog beds and present them here. Keep in mind there are innovative new beds coming to the market every day. With the tools we have provided in this article, you will be able to choose the right bed for your precious pooch based on her age, sleeping style, and destruction habits. Never let your furry friend sleep on the cold, hard ground. She deserves a supportive, comfortable bed just like you! Woven from our own proprietary blend of Rip-stop waterproof ballistic fabric. When it comes to the health of her bones and joints, one of the best types of beds for dogs is the memory foam bed. The value of a true memory foam bed lies in how effectively the foam supports your dog’s body. Cheap foam can be less supportive than cheap poly fill. The K9 Ballistics Orthopedic beds use a solid five inch thick foam mattress. 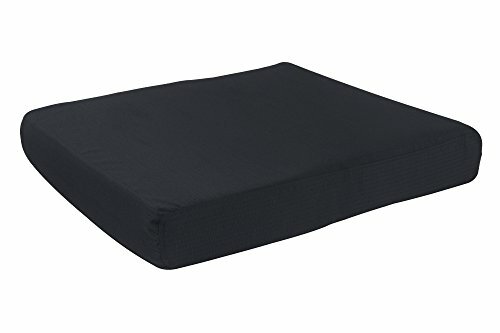 The bottom three and one-half inch thick layer is a supportive high-density foam and the top layer is a one and one-half inch thick high-density memory foam. This support minimizes pressure points on bones and joints for a better quality sleep. Fewer pressure points mean better blood circulation which benefits the whole body. These beds are backed by a 90-day chew proof guarantee. Velcro closures replace zippers (bolstered beds have one hidden zipper on the back). Strategic seam placement reduces weak spots. The proprietary TUFF flex Ballistic material and upgraded Rip-Stop technology make these covers highly durable. The covers are water resistant, odor resistant, hair resistant, and machine washable. Patented, chewproof high strength, lightweight aircraft grade aluminum frame supports up to 250lbs. Elevated/Raised orthopedic design to keep your dog dry, cool, and comfortable indoors and outdoors. Elevated beds are a great relief for dogs’ joints. The cot-style design evenly distributes their weight. There are no pressure points, such as hips, shoulders, or elbows, which would normally get sore by lying on the ground. Pillow beds harbor allergens. 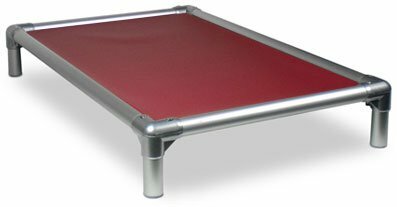 Kuranda beds have no stuffing to collect dirt, bugs, and dander. Pups that have sensitive skin or allergies often benefit greatly from this clean, foam-free design. These beds have a patented chew proof design that keeps even the most determined puppies up off the ground and on their elevated bed for years. Unlike other elevated beds which wrap the fabric around the outside of a frame making it exposed for a dog to chew, the Kuranda bed has a patented design which secures the fabric inside a special channel in the frame. This design makes the fabric totally inaccessible to chewers. There are no corner gaps in the fabric or exposed edges that your pooch could grab and chew. Kuranda beds are backed with an all-inclusive 1-year replacement warranty, except the vinyl weave fabric which is susceptible to damage from digging. This all aluminum bed has been tested up to 250 lbs. CALIBRATED FOR BIG DOGS: Available in Large, XL, Giant XXL dog bed sizes. Too powerful for small dogs. 10 YEAR WARRANTY: Foam will retain 90% of original shape & loft for 10 years or your money back. Canines feel pain just like humans. Evolution has just taught them to hide it. So, when arthritis or hip pain sears through the body of a big dog, they are hardwired to pretend everything is fine even when suffering the most. Big Barker orthopedic beds are an effective tool in eliminating joint pain and increasing overall comfort. By reducing the stress on her joints and pressure points, these beds help to increase a dog’s energy throughout the day. A good bed with appropriate padding and support can add years of quality life to an older dog with arthritis problems. 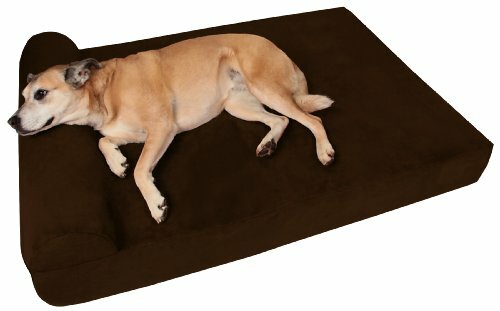 The unique 7-inch height of the bed means your pooch can just walk off her bed from lying down, not struggle to raise herself from the grounded start provided by other products. The 10-Year Can’t Flatten, Won’t Flatten warranty provides pet parents with a big clue as to the bed’s toughness. The bed covers are made with very tightly woven microfiber, making them resistant to digging and chewing. These beds are also crafted exclusively with durable furniture-grade American-made orthopedic foam. Other dog beds offer your big dog’s joints just three or four inches of foam. Every Big Barker dog bed gives your big girl a full seven inches of daily joint care and comfort. The high-density foam supports your dog’s weight and prevents your girl’s joints from sinking to the hard floor below. However, support foam on its own can feel stiff and inflexible. So, the company encases the support layer between two thick layers of comfort foam. This foam contours to your pup’s skeletal frame, providing support distribution to every area on her body. 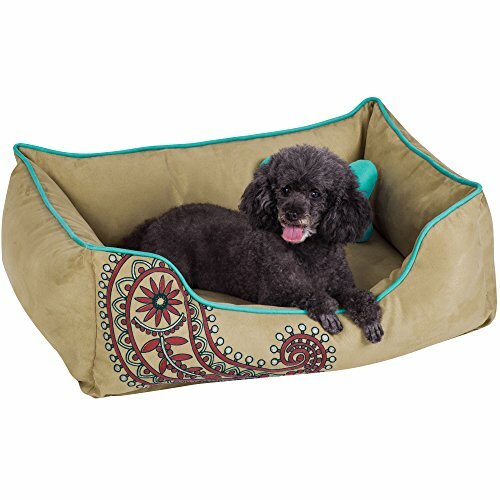 This micro suede dog bed features a supportive sleep surface and four bolstered sides. The easy step-in design and double thick fitted mattress pad add extra security and warmth for your sweet pup. The bed is reversible and resistant to the scratching and chewing of a destructive dog. It is available in 2 color combinations: champagne beige/tango red or champagne beige/brilliant blue. The bed comes with a small bone squeaker pillow for fun or snuggling. There are five separate zippers on this bed, one for each of the sides and another for the bottom. The interior of the bed includes five separate pillows with a strong nylon covering for each. The single bottom pillow has three sections which keep the fill from clumping. The heavy duty zippers are hidden beneath material flaps and are not easily accessible to curious dogs. The bed has strong detailed stitching and heavy fabric. The fill is in nylon cases which make them easy to remove for cleaning and to replace without much effort. The thick canvas outer material is heavy duty in construction, but buttery soft against your dog. Sized to perfectly fit inside the raised lip of plastic tray in a standard 48" x 30" large crate. The bottom of a dog crate is made of hard plastic and unforgiving metal. Your dog needs a crate pad that keeps elbows, hips, and pressure points resting comfortably above the hard plastic and metal. This large crate pad uses two different layers of foam. The top two inches is comfort foam which molds gently around your dog’s pressure points. The bottom two inches is support foam which provides orthopedic support and prevents your dog’s joints from grinding into the hard plastic and metal. Big Barker uses the same premium American made orthopedic foam for this crate pad as in their popular beds. The foam will not flatten or pancake and the company guarantees that with a 10-year warranty. This crate pad is 100% waterproof. Liquid or accidents should wipe off without leaving stains or smells. The cover is also highly tear-resistant and will hold up strongly against digging and nesting. It is chew-resistant, but not chew-proof. It’s easy to wash. Simply remove the cover using the extra-long heavy duty zipper and throw in the wash. NOTE: This pad is sized to fit exactly inside the raised lip of the plastic tray at the bottom of a wire dog crate. This ensures that accidents stay on the tray and don’t run off the pad and ruin your carpet or hardwood floor. Carol Cornwall has loved animals from the time of her first childhood pet, a duck named Fluff. From then, it’s been a steady parade of dogs, cats, rabbits, chickens, horses, cows, goats, and sheep. In addition to writing, she’s worked as a vet tech, cow hand, and owned a dog boarding facility. She now shares her home with three very spoiled pups. Great tips! I particularly appreciated the differences between “chew-proof” and indestructible. Is the Blueberry Premium Overstuffed Heavy Duty Pet Bed, chew proof or indestructible? Thanks for connecting to Mysweetpuppy.net. Please keep in mind that I, Claudia Bensimoun, do not write any of the blogs or reviews on this website, nor have I in the past. I only answer the comments section.All dogs need a wonderfully comfortable dog bed to rest on. It does not matter what kind of dog breed you have. With dog breeds that are apt to chew everything in sight, the Blueberry has awesome reviews. Apart from being incredibly comfortable for your dog, the Blueberry is made from a non-chew fabric with bolstered sides that are difficult to destroy. The corners are rounded making it harder for a dog to grab hold of it. You can also add a stuffed- Kong toy that has been frozen, to help occupy your pooch and soothe teething pups. Kong’s are great when filled with your dog’s favorite filler and then frozen. Hope this helps! Thanks for connecting to Mysweetpuppy.net. Please keep in mind that I, Claudia Bensimoun, do not write any of the blogs or reviews on this website, nor have I in the past. I only answer the comments section.At mysweetpuppy.net we strive to give our readers the very best dog blogs and pet product reviews. Finding the perfect, most durable dog bed can be fun and super -easy when reading our reviews. Chew and scratch resistant dog beds that are durable, and provide orthopedic support help dogs rest comfortably. Look for quality stitching, hidden zippers, durable fabrics, and ones that are created together with the collaboration of veterinarians. How do I choose a good dog bed for an arthritic old mastiff with bad back and knees? How much do I spend? Orthopedic dog beds are the best option when it comes to senior dogs. Orthopedic dog beds should be filled with memory foam or a similar fiber fill. Memory foam aids in relieving pain or trauma in the pressure points of the dog when the dog is lying down. A good orthopedic bed should have at least 2 inches of foam that will help to accommodate the pressure points where there are bony protrusions like hips and elbows.Dogs are similar to us as they age, and will have the same pains and aches. Another plus is that orthopedic dog beds help with pain from conditions like hip and elbow dysplasia, muscle loss due to aging, post surgery comfort, and bone and soft tissue injuries. An orthopedic bed will help make your dog more comfortable, and help him to sleep better. Always look for the highest quality foam which is memory foam. This will contour your dog’s body, is super soft, yet durable.